I decided the dates of the Twenty Mysteries of the Rosary and the dates of the famous stories of the Four Gospels. "Most High Lord God, do not delay any longer in sending Your Servant to bring peace to the world." The 99%'s Japanese are worshipping the demigods. So I am very anxious about their future fates after their deaths. See the Chapter 16 of THE POEM OF THE MAN~GOD. Miss Maria Valtorta wrote like this. 12. Monday, December 25, 5 B.C. of the old solar calendar of the Jews: The Nativity. Monday, December 12, 5 B.C. of the old solar calendar of the Jews: This day was the winter solstice. The mid December, 5 B.C. of the old solar calendar of the Jews, the imperial command was put up on the gate of the Nazareth’s synagogue. Israel had the rainy season from October until March. Especially, from December till January the Jews had a lot of rainfall. Moreover, of course the trip could be postponed because Mary had a reason such as pregnancy and illness. Nevertheless, Mary persuaded Joseph to go to Bethlehem. Thursday, December 21, 5 B.C. of the old solar calendar of the Jews, the sun rose at 6:44 a.m.
Bethlehem was located in south 9 km of Jerusalem, and it was 760 meters above sea level. However, Bethlehem did not have the many springs, so the population was about one thousand. The Nativity is the third Mystery of the Joyful Mysteries of the Rosary. The old solar calendar of the Jews had 365.25 days in one year. Because Mary began labor Joseph struck the doors of the houses. But the all inhabitants of Bethlehem refused them, and they arrived at an inn. But the innkeeper refused them also, so they gave up the inn. The Jews calculated their dates from sunset. The sun set at 4:53 p.m., and it became on Monday of December 25 of 5 B.C. of the old solar calendar of the Jews, they arrived at the livestock hut which was dug to the mountain. Mary was seventeen years three months and seventeen days old. The moon’s zenith which phase of the moon was 9.7 was at 7:53:28 p.m. While they were there, her days were completed to give birth, and she gave birth to her first-born Son. She wrapped Him in clothes and placed Him in the manger, because there was no room for them in the inn. The angel Gabriel said to them. Suddenly, the tremendous angels appeared in the moonlight sky, and they sang the Glory of God. As the angels disappeared into the heaven, the shepherds said to each other. They went to the cave, and they found Mary, Joseph, and the Baby Who was lying in the manger. On the other hand, the three Wise men were researching about the Mysterious star at the distance at 8 p.m.
See the Chapter 136 of The Judge on Dooms. 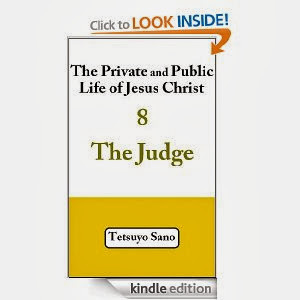 See the Chapter 136 of The Judge on Dooms of The Private and Public Life of Jesus Christ 8. 136. The Judge on Dooms. 1. Saint John wrote like this. (John 1:1). In the beginning was the Word, and the Word was with the God, and the Word was the God. He was with the God in the beginning. 1. Tuesday, December 8, 23 B.C. of the old solar calendar of the Jews: The Immaculate Conception. Saint John wrote like this. The Trinity is the Absolute. The Trinity created the heaven for the glory of Himself. The Word of the Father is the Creator. Therefore, the Word created the heaven for the glory of Himself. The Trinity created the heaven. The Trinity prepared the food, clothing and shelter of the angels. The Trinity created the angels who had the five senses and the free wills. The Trinity notified to them in heaven. As the Trinity said that the virgin will become the most high-ranking Queen of heaven, Lucifer recruited the low-ranking angels in the garden of heaven, and Lucifer brainwashed them, and they rebelled against the Trinity. The Trinity created the universe, and the Word of God condemned the evil angels, and the Trine deported them from the heaven. Therefore Lucifer and the demons made the hell. At that time, all demons disfigured, and those evil angels became to the monsters and the odd and strange colors dreadful demons. Those demons were bigoted in their hatreds forever. Sunday, January 1, about 2558 B.C., the ancestors of Abraham began the old solar calendar of the Jews on the winter solstice, and it had 365.25 days in one year. (See the Chapter 137 of The Private and Public Life of Jesus Christ 1 The General Edition). Shortly speaking, the old solar calendar of the ancestor of Abraham which was begun in about 2558 B.C. was twenty days longer in 2 A.D. than the old Gregorian calendar of the Astronomy, so the winter solstice changed from January 1 to December 12. After that, some of the Jews did not write the letters for their histories and they dictated their words to the next generation. So the Holy Spirit led the Jews, they wrote the Septuagint. Adam and Eve had the children. Adam and Eve had the child again, and they named him Seth. But the Lord God came down to see the tower of the city that the men were building, and the God said. “They are the same nation, and as they are speaking the same language, they have begun to do the insolent deeds. I cannot disturb their plan any longer, so let Us go down and confuse their language, so that they will be impossible to make themselves understand.” Thus its city was called Babel, and the God confused the language of the whole world, and He scattered them from the city all over the world. Chem named his son Terah. Abraham was the father of Isaac, and Isaac the father of Jacob. Then Matthew wrote like this. Jacob was the father of Joseph, the husband of Mary of whom was born Jesus Who is called Christ. Isaiah, Micah, and other prophets foretold about Jesus Christ. Already the Trinity gave the answer to the Jews, so they were waiting for the Messiah for a long time. 27 B.C. of the old solar calendar of the Jews: When the winter solstice became on December 12 of the old solar calendar of the Jews which I named, Augustus became the ruler of the Roman Empire. Nazareth was located at 100 km northern of Jerusalem, and it had the population of about the five hundred, so nobody had been interested in the sticks like Nazareth. 23 B.C. of the old solar calendar of the Jews, there was the married couple who were a good friendship lived in Nazareth. Joachim was the descendant of the David king Family, Anne was the daughter of the Aaron Family. They were waiting for the Messiah for a long time, and they were living harmoniously, however unfortunately they did not have a child, so they went up to Jerusalem in October of 23 B.C. of the old solar calendar of the Jews, and they prayed to the God in the Temple. Just then the God heard their prayers, and the Trine smiled at them. Tuesday, December 8, 23 B.C. of the old solar calendar of the Jews, the God worked the miracle, and the Immaculate Conception occurred in Nazareth. The Immaculate Conception was the very important thing a theological viewpoint, and Mary was endowed beauty and Grace, and the Son of God was waiting for His appearance to this world. See the Chapter 4 of THE POEM OF THE MAN~GOD. The Chapter 4. With a Canticle, Anne Announces that She Is a Mother. The forty-eight days passed. Tuesday, December 8, 23 B.C. of the old solar calendar of the Jews, the God worked the miracle, and the Immaculate Conception occurred in Nazareth. And see the Chapter 152 of THE POEM OF THE MAN~GOD. The Chapter 152. In Zebedee’s House, Salome Is Accepted as a Disciple. Jesus Christ said to Mary Salome. I, Tetsuyo Sano know this thing. The mid-January, 28 A.D. Mary Salome said to Jesus Christ. There were the Ages of Mary Salome. The mid-January, 28 A.D. (60) 27 A.D. (59) 26 A.D. (58) 25 A.D. (57) 24 A.D. (56) 23 A.D. (55) 22 A.D. (54) 21 A.D. (53) 20 A.D. (52) 19 A.D. (51) 18 A.D. (50) 17 A.D. (49) 16 A.D. (48) 15 A.D. (47) 14 A.D. (46) 13 A.D. (45) 12 A.D. (44) 11 A.D. (43) 1 0 A.D. (42) 9 A.D. (41) 8 A.D. (Saint Mary Salome was 40 years old). I omitted the old solar calendar of the Jews. Therefore, Saint Mary Salome was born in 33 B.C., of the old solar calendar of the Jews, or in 34 B.C. of the old solar calendar of the Jews. I explained the principle of the date of birth of Jesus Christ in the Chapter 137, so I will be able to omit the very hard explanations on account of not only the date of birth of Jesus Christ but also the date of birth of Holy Mother Mary. 2. Wednesday, September 8, 22 B.C. of the old solar calendar of the Jews: Mary was born in Nazareth. Nazareth was located on the hilly regions, and it was 350 meters above sea level. There was the Mt. Tabor in 9 km eastern, and the main roads of Nazareth run the eastward. Wednesday, September 8, 22 B.C. of the old solar calendar of the Jews: the moon which phase of the moon was 11.3 rose at 3:41 p.m. Mary was born in Nazareth at 5 p.m. Joachim and Anne smiled at the baby, and the sun set at 5:41 p.m.
Friday, November 25, 22 B.C. of the old solar calendar of the Jews, the priest has purged Anne at the Temple of Jerusalem. It is said that Holy Mother Mary was born on September 8, and she was said to have been born in Nazareth. 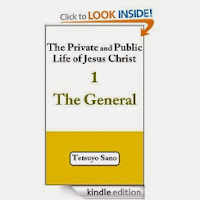 See 6-(5) of the Chapter 137 of The Private and Public Life of Jesus Christ 1 The General Edition. On August 15, 2000 A.D., it never occurred to me that I could decide the date of birth of Jesus Christ. But every day I used to meditating on with my brain and with my soul about them, because it was worth trying at all events. Needless to say, in those days, I did not have the conception of the old solar calendar of the Jews yet. On August 27, 2002 A.D., the early morning, I hit the answer to the problem as I was dazzling on bedding. If I explained by the old Jewish calendar with respect to the whole dates of the Private Life of Jesus; I will have many contradictions. The old solar calendar had 365.25 days in one year. On the other hand, the old Jewish calendar had 29.5 days × 12 months. In other words, they had 11.25 days differences in one year. So if I explained only the date of birth of Jesus Christ by the old Jewish calendar, I have no contradiction. But if I explained the whole dates of the Private Life of Jesus Christ by the old Jewish calendar, I will have many contradictions. The scholars of the Primitive Greek Orthodox Church adopted the Julian calendar. So I realized that the Primitive Roman Catholic Church’s scholars knew that Jesus Christ was born on December 25 by the Holy Tradition. Jesus Christ taught His birthday to His apostles. But His apostles did not teach about the conception of the old solar calendar of the Jews to their disciples. So nobody could decide the collect date of birth of Jesus Christ for the twenty centuries. But, in those days, after I realized about the contradictions of the old Jewish calendar, I taught to my friends like this. That is, I changed the calendar from the old lunar and solar calendar to the old solar calendar of the Julian calendar. But, in those days, I could not make the conception of the old solar calendar of the Jews yet. On October 20, 2004 A.D., I made the theorem of the old solar calendar of the Jews. 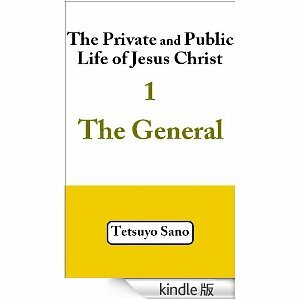 The old solar calendar of the Jews was the solar calendar of the Jews before 8 A.D.
See the Table of Chapter 1 of The Private and Public Life of Jesus Christ 1 The General Edition. The mid-January of 22 B.C., of the old solar calendar of the Jews, Saint Mary Salome was eleven years old. In short, Saint Mary Salome was elder than Holy Mother Mary by eleven years. See the Chapter 5 of THE POEM OF THE MAN~GOD. 5. Birth of the Virgin Mary. And at the same time a huge rainbow stretches its semicircle across the sky. It rises, or seem to rise, from top of Hermon, which kissed by the sun, looks like a most delicate pinkish alabaster: it rises up in the clear September sky and through an atmosphere cleaned of all impurities, it crosses over the hills of Galilee and the plain to the south, and over another mountain, and seems to rest the other end on the distant horizon, where it drops from view behind a chain of high mountains. It rises up in the clear September sky. I, Tetsuyo Sano know the date of birth of Holy Mother Mary. Wednesday, September 8, 22 B.C. of the old solar calendar of the Jews: Mary was born in Nazareth. 20. Tuesday, January 7, 27 A.D. John the Baptist was preaching at the Jordan River. John the Baptist replied in the words of Isaiah. They belonged to the Pharisees, so they asked. Then the sun of January 7 of 27 A.D. set at 4:53 p.m.
From now on, you will be able to read my theories of the Public Life of Jesus Christ. Those calendars of the Public Life of Jesus Christ were the Julian calendar. 21. Wednesday, January 8, 27 A.D.: The Baptism. The Baptism is the first Mystery of the Luminous Mysteries of the Rosary. Wednesday, January 8, 27 A.D. Holy Mother Mary was praying to the Father God in Nazareth. She was forty-seven years and four months old. Jesus Christ was thirty years and fifteen days old. Wednesday, January 8, 27 A.D., the zenith of the sun was at 11:48:11 a.m. The next day, John the Baptist saw Jesus coming to him. Jesus came up immediately from the water. Then the heaven was opened, and He saw the Spirit of God descending like a dove and lighting on Him. Just then a voice from the heaven said. Wednesday, January 8, 27 A.D. – Wednesday, September 8, 22 B.C. of the old solar calendar of the Jews = forty-seven years and four months. So Holy Mother Mary was forty-seven years and four months old. Wednesday, January 8, 27 A.D. – Monday, December 25, 5 B.C. of the old solar calendar of the Jews = thirty years and fifteen days. So Jesus Christ was thirty years and fifteen days old. John the Baptist was senior than Jesus Christ by six months, and they were relatives. They seem to have had the pure lives in their private lives, and they were in respect with each other. Saint John wrote like this in his Gospel. (John 1:29). On October 14, 2002 A.D., I decided the dates from the Chapter 19 until the Chapter 23. See the Chapter 45 of THE POEM OF THE MAN~GOD. 45. Jesus is Baptized in the Jordan. So that man should have no excuse or doubt in following or not following Me. 44. Friday, January 2, 28 A.D. Jesus met a woman of Samaritan. The Pharisees heard that Jesus Christ had the more disciples than John the Baptist, and His disciples were baptizing. Friday, January 2, 28 A.D., the zenith of the sun was at 11:46:13 a.m.
Jesus tired as He had a long journey, so He sat down by the well, and His disciples had gone away into the village to buy food. It was about at the noon. When a woman of Samaritan came to draw water, He said to her. The woman of Samaritan said to Him. The Jews did not associate with the Samaritans, but He said. She left her water jar, and she went back to Sychar, and she said to the inhabitants. So they went out the village and came to Him. Meanwhile, His disciples offered the foods, and urged Him. They said to each other. The Samaritans believed in Him because of the woman’s testimony; “He told me everything I have ever done.” So when they came to Him, they urged Him to stay with them. The sun set at 4:49 p.m. The moon which phase of the moon was 16.9 rose at 6:35 p.m. Jesus stayed at Sychar for two days. They were between from on January 2 of 28 A.D. until on January 3, and January 3 was the Sabbath. Because of His words the inhabitants more believed in Him. Sunday, January 4, 28 A.D., they said to the woman. Jesus said to the woman of Samaritan. In 1976 A.D. I learned the basic things of the theologies of the Roman Catholic Church. On April 9, 1977 A.D. I received the baptism of the Roman Catholic Church in Miyazaki Catholic Church. I read the various fields’ books. Especially, I was care for the books of Saint John of the Cross, Saint Teresa of Avila, and Saint Augustine of Hippo. I have ever read the Japanese Editions of The Way of Perfection, and The Interior Castle of Saint Teresa of Avila. When I read The Interior Castle, she wrote in her book like this. In our souls there are the seven rooms, and the God lives in the depth of the seventh room. When I read the scene of the woman of Samaritan, I usually linked that Jesus’ Words to the seventh room of the Interior Castle. Saint John filled out his important theories in his Gospel, and it was necessary for him to tell the truth. There was something mysteries about Saint John. When he was young he made up his mind to be a writer. He was capable of meditating and he was engaged in meditating the Jesus’ Words, and he was equal to his life work. He was knower than any other writers about the dates of the Four Gospels. For example, he did not write the order of the stories at random, and he got through with his work. I can agree with him on the matter. Therefore he played on important role in maintain the faiths and the theologies of the Roman Catholics, and what he wrote count for much. See the Chapter 140 of THE POEM OF THE MAN~GOD. 140. In the House of Cleopas, the Head of the Synagogue. I researched the Sun-rise, the Sun-Zenith, and the Sun-down of 28 A.D.
See the Chapter 148 of THE POEM OF THE MAN~GOD. 148. Jesus Visits Baptist near Ennon. It is a clear moonlight night, so clear that the ground appears in all its details and the fields, covered with corn which has just come up, look like green-silver plush carpets, on which the country paths seem dark stripes, watched over by the tree trunks that are white on the moonlit side and completely dark on the other. Jesus is walking steadfast and alone. He proceeds very fast along His way until He reaches a stream that is flowing down gurgling towards the plain in the north-east direction. He goes upstream as far as a lonely spot near a woody slope. He moves to one side. Climes up a steep path and arrives at a natural cave on the side of the hill. In short, at 10 p.m., on Sunday, January 5, 28 A.D., Jesus Christ visited John the Baptist near Ennon. 45. Saturday, January 10, 28 A.D. Jesus went into the synagogue of Nazareth. Sunday, January 4, 28 A.D., Jesus Christ left Sychar and He went back to Nazareth of Galilee. See the Chapter 38 of 1 The General Edition. Saturday, January 10, 28 A.D.: When Jesus went into the synagogue of Nazareth, the Nazarenes welcomed Him. Many people are indifferent to the dates of the Four Gospels, so at least you should make the most of this book when you read them, and you should take the data of the Astronomy into consideration. Then you should go over my theories in detail. Friday, April 7, 30 A.D.: The Crucifixion. Friday, April 7, 30 A.D., Holy Mother Mary was weeping, and she was praying to the Father God. She was fifty years six months and thirty days old. Jesus Christ was thirty-three years three months and fourteen days old. So many of the Jews read this, for the place where He was crucified was near the city. It had been written in Hebrew, in Latin, and in Greek. So the chief priests said to Pilate. The soldiers divided up Jesus’ clothes and made four parts for each soldier. But Jesus’ garment was without seam, woven from top to bottom, so they said to one another. So the prophet of Scripture foretold, “They parted My clothes among them, and they drew lot for My garment.” (Psalm 22:18). Friday, April 7, 30 A.D., the zenith of the sun was 11:40:32 a.m.
Near the Cross of Jesus stood Holy Mother Mary, Mary Salome, Mary Magdalene, and John. When Jesus saw Hid mother and John there, He said to His mother. From this day on, John took her into his home. It was at 3 p.m., Jesus realized that all things were completed, and the Scripture were fulfilled, so He said. The soldier took a sponge, filled it with wine vinegar, and put it on a reed, and lifted it Jesus’ lips. At that time, He cried out in a loud voice, and He passed away on the Cross. Lucifer and his followers gave off the awful spirits’ powers on Friday of April 7 of 30 A.D. But after all, the plans of them went wrong, and their behavior seemed to be that of an uneducated person. When it was that the Redeemer Jesus Christ passed away? In 1999 A.D., I decided the date of death of Jesus. But little do you realize how important this date is. My theories were made up of the data of the sun and the moon. For example, in 4 B.C., Herod the Great passed away. At that time, there was the matter of the lunar eclipse. That is to say, 99.99%, Friday, April 7, 30 A.D., the enemies had crucified Jesus, so He passed away at 3 p.m. on the Cross. 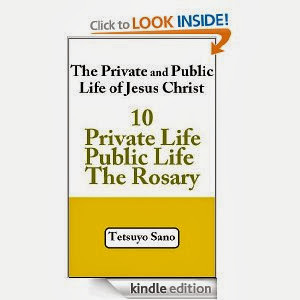 Therefore I thought that this Chapter was the substantial Chapter 1 of The Private and Public Life of Jesus Christ. I am completely accustomed to those kinds of meditations now. I can speak Japanese, and English as well. But I am afraid I cannot make understood the theologies of the Trinity in English. Could you make out what I was saying? Keep in mind that I am not as health as I used to be. When I was a boy, I was fond of Baseball, and I enjoyed the Baseball game very much, but something is wrong with my both shoulders, because my shoulders were dislocations. When we are in good health, we are apt to forget its value, and it was not until I lost my health that I knew its value. Sickness often results from drinking too much, and it is not until we become sick that we appreciate the value of health. Too much exercise of pitching and drinking will do you harm, so I walked for sake of my health. I make it a rule to take a walk every evening and pray to the God, and I go for the game of Go in Yahoo Japan. But something is the matter with my schedule of life, because sometimes my body is out of order. You know, the Four Gospels are the real masterpieces. I think they are worth reading to over and over again. So let’s go over the Bible, because I think that the crest of the heaven might be the Cross of Jesus Christ. That is why the top of the crown of Holy Mother Mary of Fatima was the Cross of the Redeemer Jesus. Jesus laid His right hand on Saint John, and said to him. Wednesday, April 5, 30 A.D., Jesus spoke about the Last Judgment. Jesus Christ spoke about the Last judgment. That is, Jesus said like this. “Come, you who are blessed by My Father, and take your inheritance, the kingdom prepared for you since the creation of the world.” In a word, the demons lost the Graces as a result of they denied the Word of God. The same way, the many persons made little of Jesus’ advices and they went down the eternal dreadful hell. Who is it that overcomes the world, but he who believes that Jesus is the Son of God? This is He Who came by water and blood; Jesus Christ, not only by water, but also by water and blood. And it is the Spirit Who testifies, because the Spirit is the truth, for there are three that testify; the Spirit, the water and the blood, and these three are one. And see 1 Corinthians 15:25. Saint Paul wrote like this. I know that the Rosary is the strongest weapon against Lucifer and the demons. So compare with the Roman Catholic, other religions in the darkness are lacking in depth, and there is no account for taste. We should meditate on the eternal Justice of the Father God and His Love. When we have the free time, we ought to be pray the prayer of Fatima in addition to Our Father, Hail Marys, and Glory be to the Father. 2. Through Him all things were made, and without Him nothing was made that has been made. (John 1:2-3). 3. The Trinity created the heaven. 4. The Trinity prepared the food, clothing and shelter of the angels. 5. The Trinity notified to them in heaven. “The virgin will be with Child and will give to a Son, and will call Him Immanuel.” (Isaiah 7:14). 6. As the Trinity said that the virgin will become the most high-ranking Queen of heaven, Lucifer recruited the low-ranking angels in the garden of heaven, and Lucifer brainwashed them, and they rebelled against the Trine. 7. The Love said. “Let there be light.” (Genesis 1:3). Therefore Lucifer and the demons made the hell. At that time, all demons disfigured, and those evil angels became to the monsters and the odd and strange colors dreadful demons. Those demons were bigoted in their hatreds forever. See the Chapter 243 of THE POEM OF THE MAN~GOD. John Repeats the Speech Made by Jesus on Mount Tabor. Saint John taught the Speech made by Jesus Christ on the Mt. Tabor to His female followers. 8. The long time ago, the Big Burn was happened, and the universe is becoming larger and larger, because the lights of the Big Burn are spreading out boundlessly. 9. The God separated the light from the darkness, and He called the light “day,” and the darkness called “night.” (Genesis 1:4-5). The God created the earth and the moon, and He made the moon as it was. So the sun, the moon, and the beautiful earth were drifted in the universe in very precisely not by chance. 10. The God created the sky, the mountains, the dry grounds, the rivers, and the seas. (Genesis 1:6-10). 132. The Word of God is the Creator. The nature is our living teaching, and the nature is whispering to us. So if you have the normal five senses, you will be able to see, hear, smell, taste, and feel the traces of the miracles of the Creator, and you will be able to recognize the God really exists. But you are blinds, so cannot know Who He is. Therefore the Creator talked about Him with the revelations and the prophecies, and after the individual judgments the God is drawing the good spirits to Him. The good spirits are living in the heaven with the angels who were created by Trine before the Creation of this universe. On the other hand, the bad spirits are living in the hell with the demons. After the Creation of this universe, the Trine expelled the demons from the heaven, because they denied the Word of God. And the bad spirits are suffering from the hatred themselves which were willing up from their spirits, and they are weeping and gnashing of teeth in the everlasting hell. In short, as the God gave the free wills and the five senses to them, they have the responsible for not only to their spirits but also to their fleshes. Therefore the roles of the spirits in this world were very greats. They had to select either the true God or the Mammon on the earth, because they could not serve both the God and the Mammon at the same time. So we should hear the faint voices of our consciences, and learn the truth of the nature, and we should use our five senses for learn about the God really exists. Between you and me, we have no useless time for the leisure, the watching TV, the chatting, and the collecting of no use. The Love said. “Let there be light.” (Genesis 1:3). Then the long time ago, the Big Burn was happened. The Trinity created the universe, and the universe is becoming larger and larger, because the lights of the Big Burn are spreading out boundlessly. As the Creator was Almighty, before the creation of this universe He had the assurance to make the earth and the human being who had the five senses and the free wills. See the Chapter 108 of 1 The General Edition. Jesus Christ said like this. Before the creation of this universe, already the Creator had created the heaven. After that Lucifer and the demons made the dreadful hell. The Creator created the Milky Way Galaxy, and He aimed at the solar Galaxy system, because it had the sun, and the earth. The date of birth of Jesus Christ. 1. Monday, December 25, 5 B.C. of the old solar calendar of the Jews: Jesus Christ was born in Bethlehem. Sunday, January 7, 4 B.C. of the old Gregorian calendar of the Astronomy: Jesus Christ was born in Bethlehem. But this calendar did not exist in the History. Nevertheless, the upper two dates were the same dates. Jesus Christ was born after sunset, and Jesus Christ was Jew. Therefore, Sunday, December 24, 5 B.C. of the old solar calendar of the Jews altered Monday, December 25, 5 B.C. of the old solar calendar of the Jews. Anyway, I adopted the data of Sunday, January 7, 4 B.C. of the old Gregorian calendar of the Astronomy for the date of birth of Jesus Christ. For writing the Private and Public Life of Jesus Christ which book was made by me, at first I had to decide the date of death of Jesus Christ? I examined from 15 A.D. until 40 A.D., and I noticed that the feast of the Passover has begun since the sunset of Friday of 27 A.D., 30 A.D., 33 A.D., and the other years had no value to examine except for them, for they had the contradictions of the day of the week and the period. The next important thing for decide the date of birth of Jesus Christ was to know the beginning date of His Public Life in correctly. The general scholars wrote like this. However it was not so, as a matter of fact, the Public Life of Jesus had begun since on Wednesday of January 8 of 27 A.D.
Jesus began His Public Life when He was thirty years old. Therefore simply speaking, Jesus was born in Bethlehem from the early January of 5 B.C. until the early January of 4 B.C. 2. Holy Mother Mary and Jesus Christ taught their birthdays to the apostles. These dates were the Holy Traditions of the Roman Catholic, so I researched about the kinds of calendars, and so on. 1 The General Edition is comprized of 2, 3, 4, 5, 6, 7, 8, and 9. 10 is comprized of 2,3,4,5,6,and 7. 11 is comprized of 8 and 9. 12 is comprized of 2,3,4,5,6,7,8,9,and The Japanese Edition.